Fidelity Medical Products utilizes several types of medical devices that provide a deep tissue massage designed to increase circulation in the body's venous and lymphatic systems. This therapy helps to control swelling and pain while increasing flexibility and strength in the affected arm or leg. Lymphedema is the accumulation of lymphatic fluid in the arms or legs. When the impairment is so great that the fluid accumulation exceeds the lymphatic transport capacity, an abnormal amount of protein rich fluid collects in the tissues of the affected limb. Left untreated, this stagnant, protein-rich fluid causes tissue channels to increase in size. The lymphatic system is part of the circulatory system and consists primarily of lymph vessels, nodes and tissues. Networks of the lymphatic system are located throughout the body. The lymphatic system removes impurities from the circulatory system and produces cells necessary in fighting various bacteria and viruses that can cause infections such as cellulitis. Lymph vessels are channels containing colorless fluid called lymph. Lymph is comprised of white blood cells and waste products for lymph tissue. Lymph fluid passes through valves located in the lymph vessels. As fluid passes through these nodes, harmful bacteria and viruses are removed. 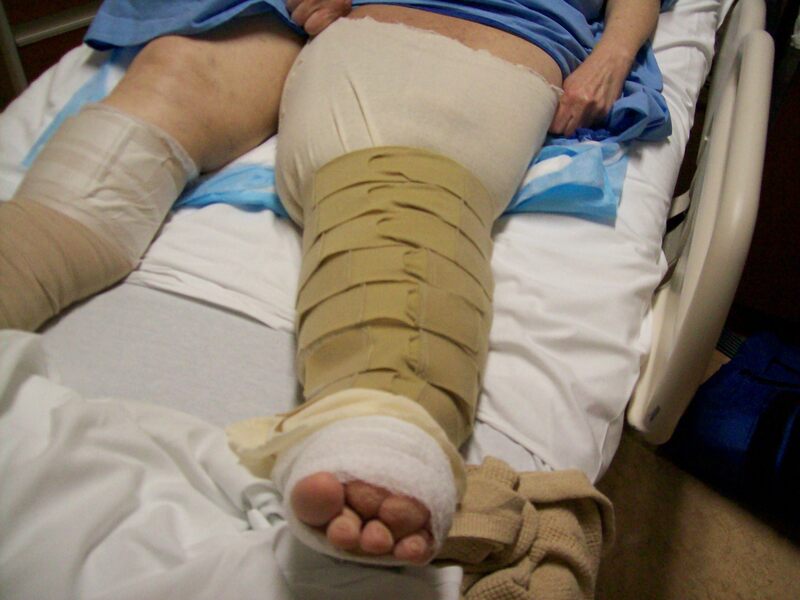 Ready to Wear Circaid Non-Stretch Compression Bandaging System applied after compression therapy treatment. 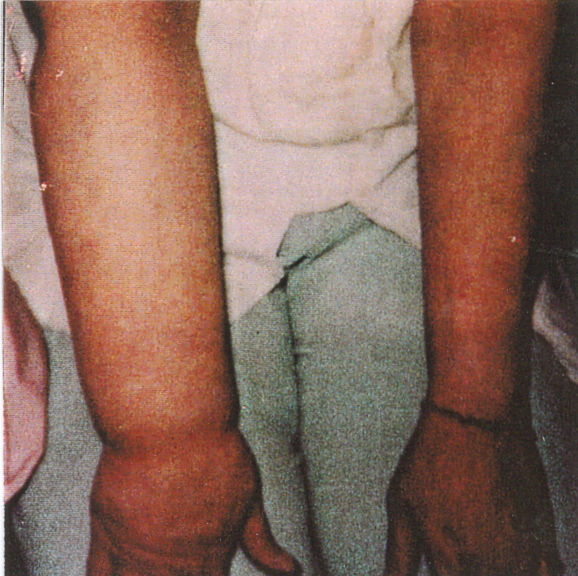 Primary lymphedema may be congenital in nature or present at birth. It is more common during the second and third decades of life and is called lymphedema praecox. Milroy's disease is a chronic hereditary condition and presents at or near birth. 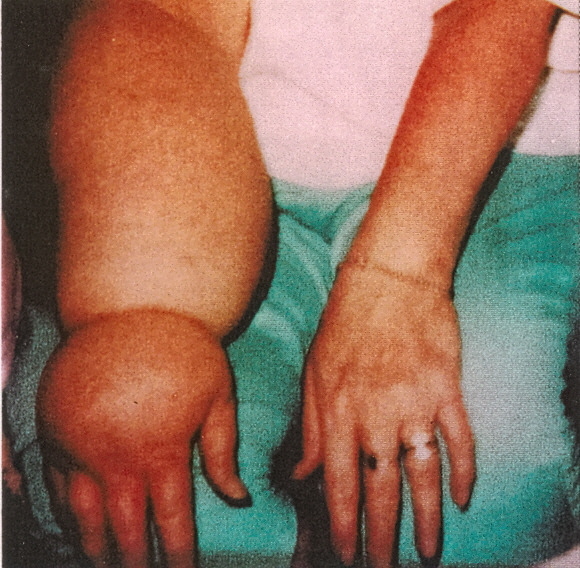 In some cases it develops after the age of 35 and is called lymphedema tarda. Secondary lymphedema is the result of damage to the lymphatic system for a variety of reasons including surgery, trauma, radiation and infection. Surgical procedures interrupting normal lymphatic function such as surgery for cancer in the breast or groin areas may prevent lymph fluid flowing naturally through its system. A traumatic injury may affect the lymphatic system, damaging the normal flow of lymphatic fluid. Radiation therapy can damage an otherwise healthy lymphatic system by causing scar tissue to form, subsequently interrupting the normal flow of lymphatic fluid. In addition, repeated episodes of infection can cause progressive closure of the lymphatic system, thus worsening the condition. While there is no cure for lymphedema, there are several effective medical devices designed to help treat and control this condition. These devices utilize a short-duration, high-pressure cycle which provides a sequential massage pattern to the arms and legs. Maintenance of the arm or leg may also require the use of a graduated compression garment or bandaging system in conjunction with the compression therapy device.